The LDG Z-100Plus has replaced the hugely popular Z100. Improvements include reduced current draw, and a metal case. An internal frequency counter has been added so the operating frequency is stored with the tuning paramters to make memory tunes a blazingly fast 0.1 seconds. Full tunes take about 6 seconds. This simple device is still small, lightweight and is perfect for portable as well as sitting on your desk in your shack! The Z-100Plus will tune with 0.1 to 125 watts (100 watts on 6 meters), making it an excellent choice for almost any radio or operating style. Backpackers and QRP operators will appreciate the latching relays. Power can be removed from the tuner once you have tuned. Additionally, when the tuner is idle, it is essentially off, drawing less than a microamp! Additionally, the Z-100Plus features 2000 fast memories which will decrease tuning time up to 95%! Simple operation is the key to the Z-100Plus. Provide a continuous carrier, then press and hold the tune button for 1 second. The Z-100Plus tunes. The red LED indicates tuner activity and the green LED indicates an SWR of 1.0 to 1.5 (steady green LED) and 1.5 to 2.0 (blinking green LED). If your antenna is already resonant, place the tuner in bypass. Pressing and releasing the tune button quickly will bypass the tuner, taking all tuning components out of line. 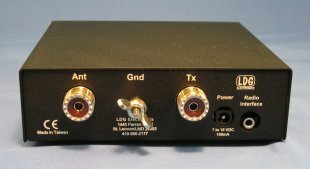 The operating range is 1.8 to 54 MHz and will tune a 10:1 SWR (3:1 on 6 meters) down to 1.5:1 or less. It will tune almost any coax fed antenna including dipoles, beams, and verticals. Add any 4:1 Balun to use ladder line or to tune long wire or Zepp antennas. This tuner carries a two year manufacturer's limited warranty. Radio cables are not included (see below). * Latching relays, holds tune position forever. * Enclosure: 5.5 x 5.5 x 1.5 inches 16 oz.